CLARION – Senior strong safety Nick Sipes of Curwensville was named an academic all-district first teamer early last week and then pulled down the curtain on a brilliant Clarion career with a typical senior season performance, highlighted by a team-leading 10 tackles, as the Golden Eagles treated a Memorial Stadium crowd of 2,800 to a 49-10 rout of Millersville Saturday. Sipes, who was one of 13 seniors recognized before the game, had two tackles for losses of three yards, forced a fumble and broke up a pass in the non-conference win that set Clarion’s record at 4-7. The College Sports Information Directors of America select the members of the CoSIDA/ESPN The Magazine Academic Teams, and Sipes rated top defensive unit honors in District 2 with a 3.75 QPA in Biology, Pre-Med. District 2 includes Division II, Division III, National Association of Intercollegiate (NAIA) and junior colleges in Pennsylvania, West Virginia, New Jersey, Delaware, Maryland and the District of Columbia. 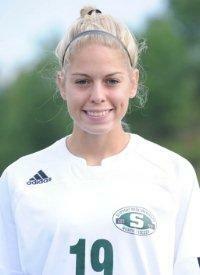 Sipes has been a Clarion and Pennsylvania State Athletic Conference Scholar Athlete the last three years. The 5-10, 215-pounder, who spent his sophomore season as starting fullback and special teamer, made it back-to-back seasons with triple-digit tackles in his third campaign on defense. He led the Golden Eagles in tackles in 10 games, seven with 10 or more stops, and finished with 107 tackles, including 50 solo hits. He was involved in 12 tackles behind the line of scrimmage, had one sack, caused three fumbles, recovered one fumble, intercepted one pass and broke up two passes. Currently, Sipes is third in the PSAC in tackles and tied for fourth in forced fumbles. He ranks No. 18 in NCAA Division II with his average of 9.73 tackles per game and No. 39 in forced fumbles. A knee injury he suffered in the off-season prevented free safety Shawn Sopic of Curwensville from joining Sipes in the Clarion secondary, but the 6-2, 210-pound three-year letterman will be eligible to play next fall as a redshirt senior. OBERLIN, Ohio. – Sophomore right cornerback David Kalgren of Curwensville was the No. 2 tackler for the Oberlin (4-6) defense against Allegheny Saturday with eight stops in the season finale before a Savage Stadium crowd of 2,013. A late fourth-quarter comeback by the Yeomen fell short, resulting in a 17-14 setback that dropped them into fifth place in the nine-team North Coast Athletic Conference at 3-3. Kalgren also returned four kickoffs for 76 yards and one punt for 12 yards. After being switched from quarterback to the defensive secondary this season, Kalgren finished as Oberlin’s leading tackler with 75 stops, 62 of them solo efforts. His four interceptions were tied for first and his five passes broken up were tied for third. He averaged 20.8 yards on 16 kickoff returns and 7.3 yards on 14 punt returns. NCAC stats show him No. 1 in tackles among defensive backs while sharing the lead in interceptions and tied for eighth in tackles among all defenders. NCAA Division III statistics list him tied for 39th in solo tackles with 59 and tied for 73rd in interceptions. LOCK HAVEN – Redshirt freshman wide receiver Jesse Hoover of Curwensville capped a fine rookie season for Lock Haven (0-11) by snaring two passes for 12 yards in a 41-17 non-conference loss to Shippensburg before 547 fans at Hubert Jack Stadium Saturday. The 6-1, 185-pounder proved to be the Bald Eagles’ primary deep threat with his 499 yards and four touchdowns on 27 receptions, all second on the team. His 65-yard TD against Indiana was Lock Haven’s longest scoring play of the year, and his 18.5 average per catch topped the receiving corps. Hoover also caught a PAT pass for a total of 26 points, also second for the Bald Eagles, who have lost 32 games in a row. GROVE CITY – One of 16 Grove City seniors honored prior to the 27th annual Mercer County Cup game against Thiel Saturday, Clearfield Area High School graduate Tyler Kirkwood of Frenchville started at wingback and caught one pass for one yard as the Wolverines salvaged a .500 record with a 35-21 victory at Robert E. Thorn Field. The Presidents’ Athletic Conference Rivalry Week battle drew a crowd of 2,600 that saw Grove City (5-5) pull into a fifth place tie with Saint Vincent at 3-4. Kirkwood started in five of the nine games he played on offense and special teams, making two catches for 10 yards and assisting on one tackle. In his three-year career, the 5-10, 220-pounder appeared in 28 games. He totalled three receptions for 20 yards. MADISON, N.J. – Sophomore wide receiver Jarrin Campman of Clearfield had one carry for a loss of seven yards in Lycoming’s 17-10 season-ending victory over host Fairleigh Dickinson University-Florham in front of 1,011 fans at Shields Field Saturday. The second-quarter play was the first time Campman touched the ball in eight games for the Warriors, who edged out Widener for fourth place in the Middle Atlantic Conference. Both teams were 4-3, with Lycoming’s 31-7 in their Oct. 16 meeting the tie-breaker. Redshirt sophomore David Ryan of Clearfield appeared in one game for Lycoming (6-4). PITTSBURGH – Redshirt freshman lineman Nick Redden of Clearfield played in his fifth game for Duquesne (6-4) Saturday when the Dukes clinched a winning record by defeating Northeast Conference rival St. Francis 41-17 in front of 1535 fans at Rooney Field. Duquesne is 4-3 and tied for third place in the NEC. EAST HARTFORD, Conn. – Redshirt junior quarterback/holder Andrew Janocko of Clearfield and the Pitt (5-4) placekicking unit made only four trips, all for extra points, on to Rentschler Field Thursday night as the Panthers were upset 30-28 by Connecticut in a nationally-televised Big East Conference clash with a crowd of 35,391 on hand. Pitt slipped to 3-1 in the conference but still remains in first place ahead of four teams, including UConn, with two losses apiece. INDIANA – After being sidelined by a pre-season injury, wide receiver Trey Campman of Clearfield was redshirted in his rookie year at Indiana (6-5), which closed with a 27-10 win over West Chester in a Pennsylvania State Athletic Conference crossover game that attracted 2,221 fans to Miller Stadium Saturday. BEAVER FALLS – Freshman offensive lineman Brady Dixon of Frenchville (Clearfield Area High School) was a member of the Westminster (2-8) team that suffered a 30-24 triple-overtime loss to host Geneva in its finale Saturday. A crowd of 4,450 was on hand at Reeves Field for the 113th meeting of a series that dates back to 1891. “The Game” was part of Presidents’ Athletic Conference Rivalry Week. WASHINGTON, Pa. – The Washington & Jefferson career for John Lhota of Clearfield ended last Wednesday night when the No. 2-seeded Presidents were upended 3-1 by No. 7 Grove City in the first round of the Eastern Collegiate Athletic Conference Division III South Tournament. The senior midfielder started for the 18th time this season in W & J’s first loss in more than four years to its Presidents’ Athletic Conference rival. The Presidents had edged the Wolverines 2-1 on Oct. 2 to spark a 7-0 run through the PAC regular season. 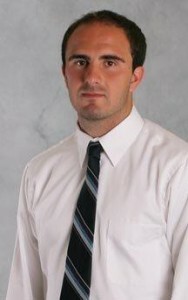 Lhota scored two goals and assisted on four others for the 12-4-3 Presidents. He recorded 22 shots, with 16 on goal. His totals for four W & J teams that were a combined 45-25-11 showed four goals, including one game-winner, and seven assists for 15 points, with 26 of his 46 shots on goal. CALIFORNIA, Pa. – Senior forward Juliana Howell of Clearfield started both games as third-seeded Slippery Rock, ranked No. 22 by the National Soccer Coaches Association of America last week, opened the NCAA Division II Atlantic Region Tournament with a 3-1 win over sixth seed West Virginia Wesleyan Friday before losing to No. 10-ranked host California Sunday at Roadman Park. After having a game-winning goal waved off because of an offsides call in the second overtime against Cal, The Rock bowed out of its sixth trip to the national tourney when the Lady Vulcans prevailed 4-2 in the penalty kick shootout. The 1-1 tie extended The Rock’s school-record unbeaten streak to 15 games and gave the team a 14-3-5 record. Howell played in 18 games, with 10 starts, and registered one goal, a game-winner, and four assists. Five of her nine shots were on goal. Howell scored 27 points on 10 goals and seven assists in her career. Four of her goals were game-winners. She attempted 58 shots, with 39 on goal, in 65 games, including 37 starts. The Rock was 55-20-10 during those four seasons. COLUMBUS, Ohio – Freshman forward/midfielder Brooke Mohney of Clearfield and her St. Francis teammates saw their season come to a close in the first round of the NCAA Division I Tournament Friday when Big 10 co-champion and No. 17-ranked Ohio State averted an upset with a goal in the 106th minute for a 1-0 double-overtime win at Jesse Owens Memorial Stadium. Slowed by an injury, Mohney appeared in only six games with one shot on goal for the Red Flash, who set school records by finishing second in the Northeast Conference regular season with an 8-2 record, winning the NEC Playoffs and posting a 15-5-2 overall record. WILKES-BARRE – Sophomore Jeff Thomas of Curwensville won two of his three bouts at 174 pounds as Lycoming (3-3) split four matches in the John Reese Duals hosted by Wilkes at the Marts Center Saturday. Thomas, who was 2-4 at 157 and 165 last season, is off to a 3-2 start with a team-leading three falls. He needed only 1:25 to deck Jimmy Neal in the Warriors’ 24-9 victory over Empire Collegiate Conference opponent Oneonta (N.Y.) and just 1:05 to flatten Jesse Capello-Colon in a 32-12 win over Hunter (N.Y.). His loss was a close 7-5 scrap with Dustin Stough of Wilkes. Lycoming fell to Wilkes 23-10 and Centenary (N.J.) 32-16. Thomas pinned Jacob Reik in 2:23 to help the Warriors down host McDaniel 24-17 at Westminster, Md., last Wednesday. 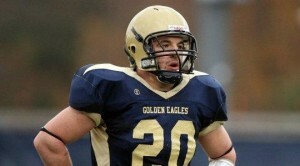 He was major decisioned 10-2 by David Priest in Lycoming’s 32-7 loss to Empire Conference power Ithaca (N.Y.) on Nov. 2. MCCANDLESS – Three-year letterwinner Brittany Barrett of Mahaffey is a member of the Penn State DuBois team that opened the 2010-2011 season with a 65-21 non-conference victory over host Community College of Allegheny College-North Saturday. The Curwensville Area High School graduate has scored 269 points and pulled down 245 rebounds in 56 games for the Lady Lions. Barrett, who plays guard or forward, also has 62 assists, 63 steals and 18 blocked shots. CLARION – Sophomore Mark Krchnak of Clearfield earned points in four events, two of them wins, as Clarion (1-3) defeated Bloomsburg 182-114 in a Pennsylvania State Athletic Conference meet at the W.S. Tippin Natatorium Saturday. In individual races, he won the 200-yard breaststroke in 2:15.31, finished second in the 200 individual medley in 2:06.32 and took third in the 100 breast in 1:01.67. He also swam the breaststroke leg in 1:00.14 to help the Golden Eagle 400 medley relay quartet win in 3:34.71. Krchnak, who transferred from Duquesne because the Division I school dropped the sport, debuted for Clarion with two wins in a 135.5-125.5 PSAC loss at Shippensburg Nov. 6. He touched the wall in 1:01.45 in the 100 breast to tie Ship’s Sean Minford and then outkicked the Red Raider in the final 50 yards to take the 200 breast in 2:15.75. In the relays, Krchnak was clocked at 27.37 seconds for the breaststroke leg as the Clarion ‘B’ 200 medley foursome placed third in 1:40.54 and turned in a 22.55-second third leg for the 200 freestyle team that wound up fifth in 1:33.17. Clarion also lost to Grove City 160-120 on Oct. 23 and to Carnegie Mellon 179-117 at Pittsburgh on Oct. 30. NEW WILMINGTON – Twins Chris and John Bodle of Clearfield have contributed points in the early going for Westminster, which has split two dual meets after placing third in the five-team Westminster Relays on Oct. 29. In the season-opening meet, the host Titans accumulated 92 points to finish behind two Division II teams, Gannon (124) and Edinboro (116). The Bodles swam the middle two legs for the Titan ‘B’ 200 freestyle relay unit that placed fourth in 1:38.11. Then, John turned in a 1:02.06 individual medley leg for the Westminster ‘A’ 400 medley quartet that was fourth in 4:07.11, while Chris posted a 53.48-second second leg for the 400 free foursome that placed fifth in 3:36.49. In a 185-106 loss to Allegheny at Meadville on Nov. 6, John placed fifth in the 200 butterfly in 2:20.27 and the 400 IM in 4:54.73 while Chris was fifth in the 100 fly in a career-best 59.82. They did not compete in Westminster’s 106-72 Presidents’ Athletic Conference win over Bethany (W.Va.) Saturday.